This piece was written by JL. Due to temporary difficulties with his account, his piece has been uploaded as a “guest” article. What followed has been an incredibly successful spell for the five time world champions. Eight wins in their first eight games, with a record of 24 goals scored and 2 conceded made Brazil the first team to qualify for the tournament alongside hosts Russia. By the end of the campaign, Brazil were 10-2-0 under Tite, and have subsequently impressed in high profile friendly matches. There is perhaps no factor more important in a team’s success than the quality of the players. As such, Brazil are undoubtedly one of the teams capable of winning this summer’s tournament. Not only do Brazil have an XI full of high quality players performing at Europe’s top clubs, but they also have impressive squad depth in almost every position. The strength of the squad is evident from Goalkeeper. Despite an excellent season for Manchester City, displaying his quality both as a pure goalkeeper, and attracting attention for his ability with the ball at his feet, Ederson plays second fiddle to Alisson. The Roma stopper has long since had the faith of Brazil goalkeeping coach Claudio Taffarel. Thiago Silva and Miranda are likely to be the starting pair for the tournament, despite Marquinhos holding down a spot for long stretches of Tite’s reign. This perhaps points to the emphasis on defensive stability, and the reduced need for strong build up players in a stability based attack. The undoubted first choice at right back, Dani Alves, has been ruled out of the tournament with a knee injury, leaving the position open for Danilo or even Fagner. While neither will be able to replace the qualities that Alves has on the ball, particularly in build up, some consolation will be that both are likely to bring a greater physical capacity to the role than the now 35 year old Alves, who is by no means the supreme box to box wing back he once was at Barcelona. Real Madrid’s Marcelo will take the left back position, bringing to the table his skillset as perhaps the best left back in football at this moment. His threat as a passer, inward dribbler and combination player make him a defensive concern for any opponent. Felipe Luis provides a more defensively stable option as backup. In the deepest midfield position, Casemiro seems to have established himself as the first choice, after a spell of contending with Fernandinho for the position. 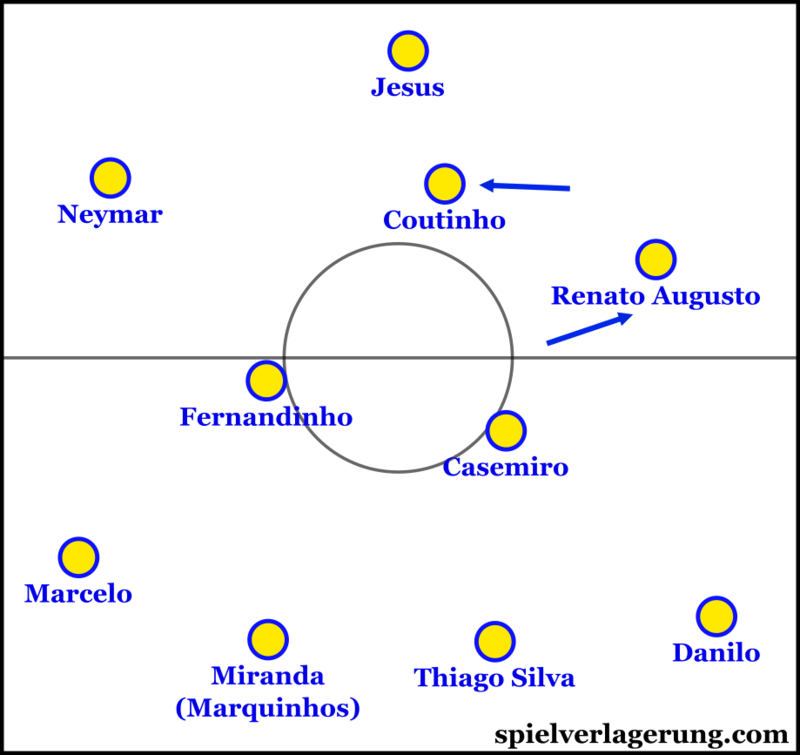 In order to accommodate both, Tite has used the City midfielder as a left side 8 in recent matches. This selection has been at the expense of Renato Augusto, who performed well in qualification. The former Bayer Leverkusen midfielder did excellently in acting as a counterbalance to the whims of his higher profile teammates, and could yet play an important part in Brazil’s tournament. Making up the 3rd man in midfield is Barcelona’s somewhat unorthodox Paulinho. Despite his somewhat bizarre play at times, his physical qualities, and most of all his goal threat have become vital to a team from which he is rarely dropped. Coutinho may well drop into the midfield three at some point during the tournament, but Tite’s focus on defensive stability will make this a rare occurrence. The biggest personnel doubt in the front line, if not the whole team, comes on the right-hand side, where both Phillipe Coutinho and Willian have made a strong case to be selected. While Coutinho was the preferred option in qualifying, Willian perhaps provides the more functional option given the role in the team the right winger plays. Elsewhere, Neymar’s position is unsurprisingly guaranteed, and Gabriel Jesus has been able to retain his place, despite competition from a key player for Champions League finalists Liverpool, in Roberto Firmino. To sum up Brazil’s overall approach as a team, one word springs immediately to mind, stability. This is perhaps most evident when watching Tite’s side in possession. With a high presence behind the ball, and in front of the opponent’s defensive block. The fullbacks initially occupy rather deep positioning in build up, not venturing far from Thiago Silva and Miranda in order to avoid any potential disconnect. Casemiro remains similarly close to the defence, as does the left 8, Fernandinho, whilst on the right Paulinho often operates at a slightly higher position, but can be seen dropping deeper to support his teammates in build up. The approach is far from new, and has become commonplace across some of Europe’s most talented sides, such as Zidane’s triple Champions League winning Real Madrid. Strategically it’s a sensible approach, with the team focused on security in possession and preventing counter attacks, the world class attacking players pose more than enough threat to create and score with regularity. Through the positioning of the midfield and full-backs, Brazil become hard to press due to their numerical superiority. If the opposition commit too many players forward in order to gain more consistent access against Brazil’s build up, the space between their defence and midfield can open up, ripe for exploitation by Neymar and co. This is particularly effective as a tactical method at international level, where man orientations are favoured due to their simplicity and lack of training time. One way Brazil could make better use of this approach is to counter any movement to receive with an opposite movement, creating a desicional crisis in the opponent, and ideally a free man. When Gabriel Jesus drops from his position as a striker to receive the ball, there is rarely a run into depth from one or both of the wingers in order to drag the defensive line deeper. As a result, Jesus can be easily followed by a centre back, and is forced to receive with his back to goal and most often play with only one or two touches. Similarly, when one of the wingers moves centrally, no other player in the team tends to occupy the wing, allowing the fullback to match the wingers movement and pressure the receiving winger. The positives of this setup are also clear in defensive transition. When Brazil lose the ball, there are as many as 6 players behind the ball and the centre backs are never left exposed. 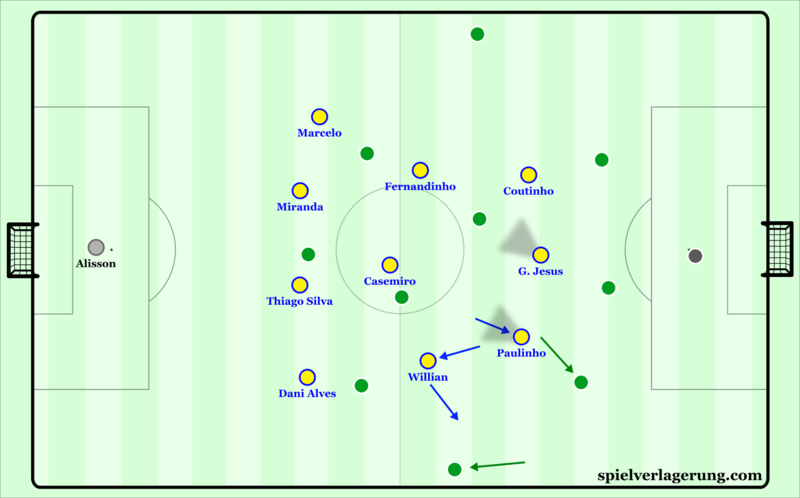 As a result, Brazil are both hard to counter attack with such defensive presence, and can also counterpress the ball effectively, particularly in the highly occupied wings. While the 4-3-3 described above is by far the most likely setup for Brazil, an adapted version which made a number of appearances in the qualifying process could yet be seen in the tournament. Tite adapted to a lack of presence behind the opposition midfield by brining Coutinho into a more central role from his nominal right wing position. As mentioned previously, doing so can leave the right wing unoccupied, and so in order to balance the movements of Coutinho, Renato Augusto would move to a wider position on the right. This allowed Coutinho to play in an area of the field more suited to his skillset, whilst also having a presence on the right side, and so maintaining the balance of the team. Augusto’s positioning was not, however, simply a means of facilitating Coutinho’s movements. From the right side, his powerful vertical runs into depth posed a threat to the opponent defensive line, whilst he also offered high quality crossing from that area. One problematic element of Brazil’s game with the ball is the lack of collective press resistance, as the stability focused structure ends up creating other problems in ball circulation. In general, the idea of creating an overload in deep areas will make the team harder to press as the opponent will be outnumbered and the press will eventually be beaten. In the case of Brazil, the outcome is not always so simple. Firstly, one problem with a stability based structure is that it can lead to poor spacing of the build up players. Ideally, a supporting build up player will be far enough away to give time and space to the ball carrier, whilst also staying close enough to be a viable passing option. With so many players in deep positions, the distances can become too short, allowing an opponent pressing access to multiple players at once. In addition, there are often a lack of forward passing options away from the area of pressure. This stems from the lack of presence in advanced areas, and can mean that only the striker and ball near winger are viable options to move away from the press, with those players often in an underload against more physically dominant players. As a result, when found these players can struggle to retain the ball. With such collective issues, Brazil are often reliant on individual dribbles, and the ability of their front three to deal with some rather hopeful long balls in order to play out of high pressure. While it can be near impossible to sustain over a whole match, aggressive pressure, particularly in transition, may be the best way to beat Brazil, particularly for the smaller nations they will face in the group stages. Tite’s focus on stability is evident from a defensive point of view, as well as an attacking one, and stems from the selection of eleven players to start the match. Despite a huge array of attacking talent at his disposal, Tite tends to only select three truly attacking players in a starting lineup for any important game. The selection of central midfielders for a match is the greatest indicator in this regard. Casemiro and Fernandinho, who each play as the deepest and most defensive midfielder for their respective clubs, are fielded together, with Fernandinho in a slightly more advanced role. The combination of two such players would likely be offset by the selection of a pure 10 or even a second striker in most teams. Brazil are not most teams. Instead, the third part of the trio is in fact Paulinho. The Barcelona midfielder is not known for his ability to play in tight areas, dribble between opponents or thread a pass through the defensive line. Rather, Paulinho is physically strong and effective in pressing, with a knack for scoring goals, in a word, he is functional. Even Renato Augusto, with his powerful running through central areas, is far from the kind of player you’d often think of as the most attacking midfielder of a three. Absence of a more attacking option is far from being the reason. Phillipe Coutinho has shown his value there on numerous occasions whilst a more appropriate right winger such as Willian or Douglas Costa has been on the pitch. What is apparent though, is that Tite is not willing to take such a ‘risk’ in the bigger, more important matches, far more comfortable opting for defensive stability over attacking threat. Brazil’s defensive strategy is an element of their game which has developed considerably over time under Tite. In the early days of his tenure, Brazil’s approach was far more passive once the opponent had established possession, defending mostly inside their own half, blocking the opponent, and waiting for a pass into a crowded area or a mistake to regain the ball. In recent fixtures this approach has changed, with the Seleção taking a more proactive approach, pressing the opponent in their own half. In the early qualifiers under Tite the defensive approach was very simplistic, most likely as a result of a lack of training time. Little attempt was made to force a turnover of the ball through pressure in the opponent half, with the focus remaining on solidity. This resulted in the primary tactic being to operate with a medium to low 4-1-4-1 block, generally within their own half. This seemed sensible given the comparative ease with which such an approach can coached and applied in a cohesive manner, compared to a more aggressive pressing style. 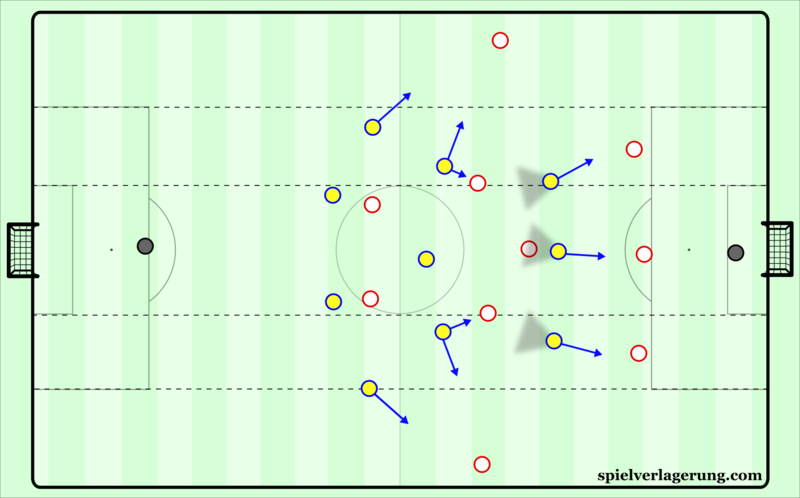 As such, from an early stage the Brazil defence showed good compactness, with minimal distances between players on the same horizontal line, and short spaces between the lines due to good positioning of the back four. This compactness was assisted by the work rate of Gabriel Jesus, who would often press backwards in order to maintain pressure on the opposition midfield. At times Paulinho moved forward to create a situational 4-4-2, and the team adapted well to maintain suitable distances in these moments. If there was to be a criticism of the approach in the early stages, it would be that it was at times too passive, relying more on the defensive quality of individuals than collective means. With more training time came improvements such as greater pressure after an internal pass, a greater understanding of how to proactively force the opponent possession into less threatening areas, and a cohesive reaction to pressing triggers, forcing a ball win or opponent mistake. The end result of this development heading into the tournament is that Brazil now have one of the most cohesive and effective defensive systems in the tournament, complimented by their elite squad of players. 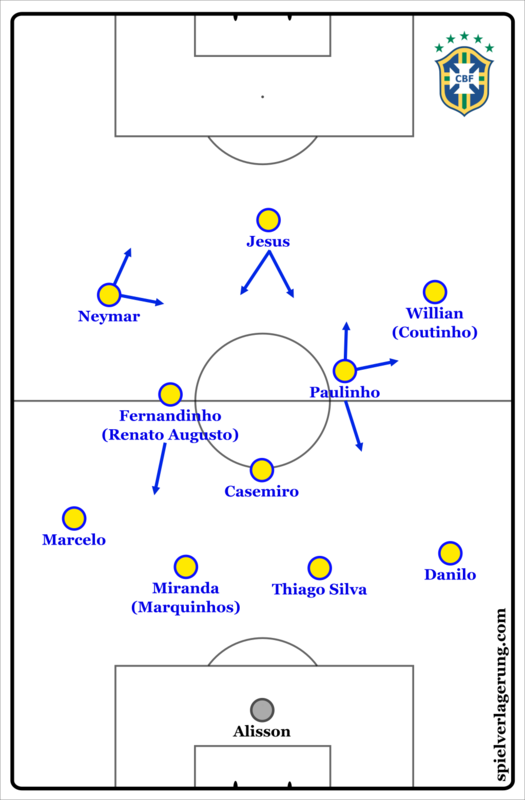 From a 4-3-3 base, Brazil maintain a high level of compactness horizontally, with the front 6 rarely occupying more than half of the field’s width. This type of defensive shape discourages vertical passes, with a high occupation of the space in ahead of the ball carrier, and instead leads to more horizontal circulation from the opponent. As a result, opponents are forced to either play through the compact block within the centre and half-spaces, or move the ball to the wings, a strategically less valuable area. Either option can be seen as a victory for Brazil. The opponent either risks a likely turnover by attempting to break through the areas already occupied by the 4-3-3, or plays into a wide area, limiting the potential options for the receiving player and making the next action more predictable. By having sufficient speed in their ball-oriented shifting, Brazil also prevent easy progressions through the wing. With the players given clear key principles, they manage to dynamically maintain a suitable structure defensively in a variety of situations. An example of this can be seen in a friendly against Germany, where Paulinho would often move to an advanced position in order to combat Toni Kroos. As a balancing movement, Willian moved to a deeper line, maintaining access to the advanced full back. These were not, however, simple man orientations. The overall 4-3-3 structure was maintained with Paulinho pressing Kroos when required, whilst also blocking passing lines to the centre and maintaining access to other opponents when Kroos was not an immediate passing option. Similarly, Willian would initially position himself within the half space, connected to Casemiro in order to deal with any threat to the middle, before moving wider when required. This, and many other examples display a clear understanding of not only the individual roles, but also the strategic principles on a team level. As a result the team can adapt to maintain a suitable defensive structure when the individual roles change. Brazil’s press is not a constant, even in recent games, and the approach can revert to the deep 4-1-4-1 depending on game state and opponent. In the event of taking a lead, the focus diverts from forcing a turnover in the opponent half towards maintaining defensive stability and preventing chances for the opponent. Against more effective possession teams, a shift to 4-1-4-1 can also be necessary once the ball is progressed into the Brazil half. A key reason behind Brazil’s shift towards pressing higher in the field is clearly to make greater use of their goal threat in attacking transition. With an abundance of speed, running power and high quality dribblers, Brazil are potentially lethal on the counter, and winning the ball higher up the field means an increased chance of a goal in transition. This may be a factor that gives Willian the upper hand over Coutinho in the battle for the right wing spot. The Chelsea winger’s skillset is perhaps more suited to a transition focused attack than Coutinho, who would be more effective with increased ball possession. Even from a lower block defence, Brazil pose a threat on the counter. If they can find a passing route to Gabriel Jesus, his hold up play is of an elite level, meaning he will almost always find a way to advance the counter attack quickly, or maintain possession until more teammates can offer viable passing options. Of course the other threat Brazil have in these moments is through Neymar. The PSG star can be seen advancing the ball 70-80 yards with a mixture of his dribbling and combination play. Brazil are a major contender for the trophy. Tite has transformed a struggling side into one of –if not the very- best sides in the world. Their stable possession is complimented by an ever improving press and counter approach, making them one of the most potent attacks in the tournament. Defensively they have an abundance of strong defensive players and an adaptable defensive system. Being one of the best teams at the tournament both tactically and individually may well be a World Cup winning combination.